Free tea cosy patterns to help Craft a cure for Cancer. Please join with us as we Craft a cure for cancer, by making a tea cosy for our exhibition in July. You could win the prize for the Best tea cosy. 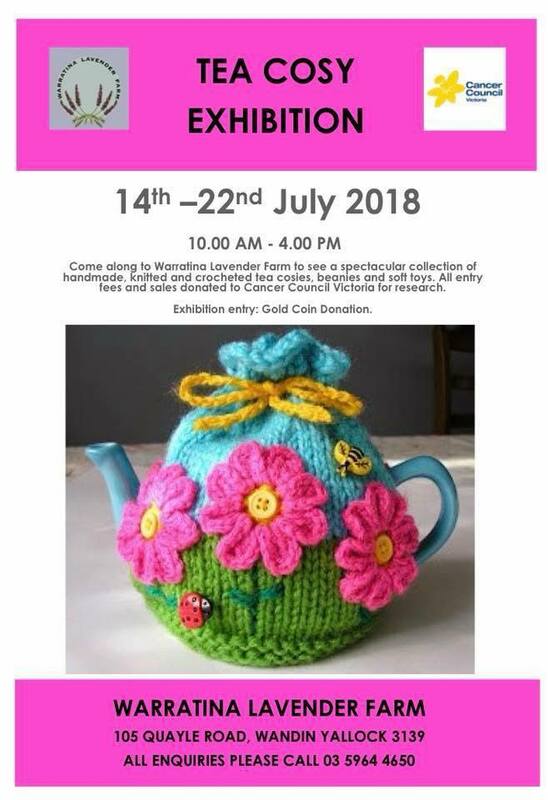 Then bring your friends along to the Warratina Lavender Farm in July to see your tea cosy in our Exhibition. There'll be a display of 40 beautiful quilts; as well as lots of varied craft items for sale. For tea cosy lovers, this is the biggest tea cosy display you'll see; and it's your big chance to buy the tea cosy of your dreams. All money raised is donated to the Cancer Council. We've raised over $50,000 so far. Please help us in our quest to Craft a Cure for Cancer. To enter the competition, make a tea cosy, and send it to the address at the bottom of the page. Pin a note on the tea cosy with your name and phone number, so we can contact you if you are a prize winner. All entries for the competition must be received by Friday, 5th July, 2019. If you'd like to donate a tea cosy, soft toy, or other craft item to our fundraiser, and are not interested in winning a prize, please send it to us by Friday 12th July. As well as tea cosies, small soft toys are a favourite with our customers, and are a very welcome donation. 105 Quayle Road, Wandin Yallock, from 13th to 21st July 2019. For some creative ideas and free patterns, check out www.facebook.com/teacosycompetition, andhttp://teacosycompetition.blogspot.com . To make a donation to the Tea Cosy Competition fundraising effort for the Cancer Council, go to http://i-will.cancervic.org.au/event/craftacure. Please note that the tea cosies or other items that you send to us cannot be returned. They will be displayed and sold at Warratina Lavender Farm, to raise money for the Cancer Council. Any that remain unsold after the display will be sold at Lorenti Café, Park Rd, Park Orchards, or at markets and other events from time to time. All money raised will be donated to the Cancer Council. 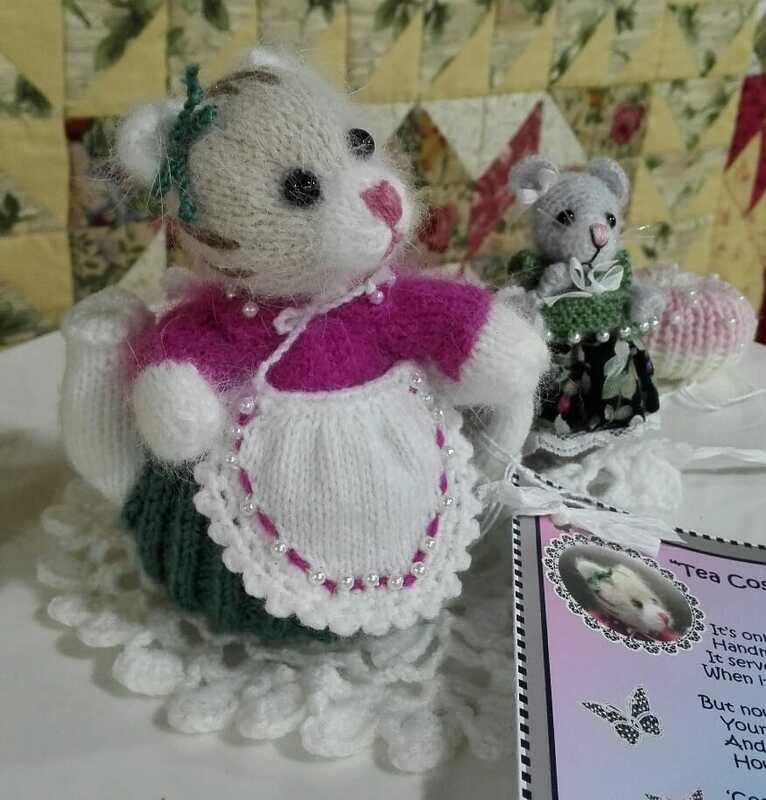 Post your entries to 'Tea Cosy Competition', PO Box 109, East Ringwood, 3135, Victoria, Australia. Entries can be left with Annemarie at the tea rooms, Warratina Lavender Farm, 105 Quayle Road, Wandin Yallock. Entries can be left with Chris and Sandie at Lorenti Cafe, Park Rd, Park Orchards (near the corner of Hopetoun Rd). The cat was the 'People's Choice', with the chicken coming in second, and the dog, third. In the end the votes for the three were very close. The dog had been the early leader, but was overtaken by the chicken and cat in the last few days. The animals are the winners! 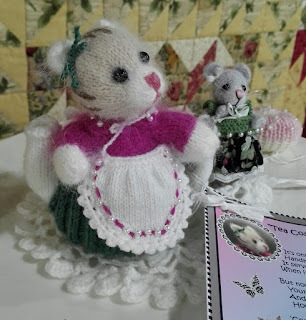 The little cat is a tea cosy; it's so tiny that Irene had to make a special tea pot for it, as she couldn't buy one that was small enough. 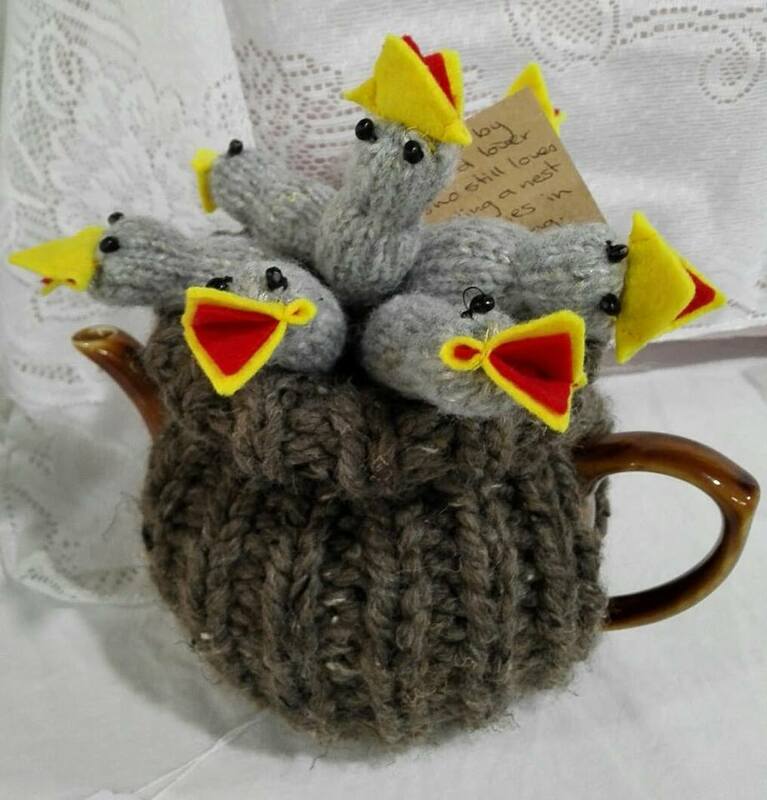 Please note our new fundraising page is at https://craftacure.everydayhero.com/au/teacosy-competition. 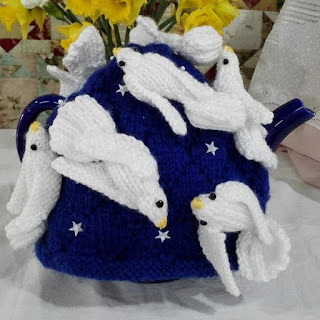 For all the details on how to enter the Tea Cosy Competition for 2018, click on the ' Tea Cosy Competition Information' tab, above. Or scroll down past the owl pattern, the information is below that. 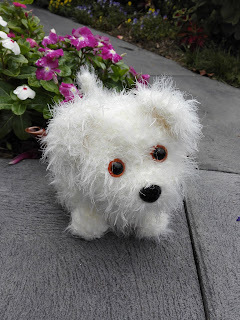 Here's the updated version of the dog tea cosy pattern. Enjoy. Please help us in our fundraising effort for the Cancer Council...we're crafting for a cure for cancer. You’ll need 4x50g balls of Passioknit Cassowary, in White. One pair of 6 mm knitting needles. 2x double pointed 6mm needles, used for knitting the I-cord for the tail. A small amount of polyester fibre-fill. The tea cosy measures 20 cm wide and 16 cm high when laid flat. Use two strands of Cassowary (or one strand of cassowary plus one strand of 8ply yarn) worked together throughout the project. This will produce a firm thick fabric; perfect for keeping the tea in your pot nice and warm. Work for 10 cm in garter stitch (knit every row). Start decreasing: Row 1. K2, K2tog, K to the last 4 stitches, K2tog, K2. Repeat these 2 rows till 22 sts remain. Tie a length of coloured yarn around the thread that lies between the 11th and 12th stitches. This marks the position where the tail will be attached later. Continue decreasing as before, until 14 stitches remain. With 6mm needles, and two strands of yarn, cast on 26 stitches. Knit 2 rows. Mark the positions for paws by tying a length of coloured yarn on the thread between the 9th and 10th stitches, and between the 17th and 18th stitches. Continue knitting until the work measures 10 cm. Tie a length of coloured yarn on to the thread that lies between the 10th and 11th stitches. This marks the position where the centre back of the head will be attached later. Continue decreasing until 14 stitches remain. Stitch the front and back together by joining 2½cm at the base. Leave a 10cm gap each side for the handle and spout, then join across the top. Using 2strands of yarn together, cast on 20 sts. Next row, (Increase in next st, K1), repeat to the end of the row. (30 stitches). Continue, knitting every row without shaping until the work measures 6 cm. Row 4. K8, K2 together, tie a coloured yarn onto the thread between the 9th and 10th stitches. K4, tie a coloured yarn onto the thread between the 13th and 14th stitches, K2 together, K8. These two pieces of yarn mark the position of the eyes. Repeat this row till 10 sts remain. Cast off. Tie a coloured thread on the middle stitch of the cast off row. This marks the position where the nose is attached. Fold the head in half, so that the two side edges are together. With a length of yarn, sew along the outer edges of the work from the nose marker on the cast-off edge, all the way along the side edge. Leave the cast-on edge open. With a 60cm length of plain yarn in a matching colour, sew a running stitch around the cast on edge, leaving it open. The marker on the cast off edge is the spot to place the nose. The side seam of the work is the lower edge of the head. On the upper side, the eyes and the nose are positioned to form a 4cm equilateral triangle. The markers will help find the approximate spots, but it’s a good idea to make some small adjustments to the positions to give a cute appearance. Attach the nose and eyes. Using some polyester fibre, stuff the head quite firmly, and close by pulling the ends of the running stitch. Fasten, but don’t cut off the excess yarn. To give the face a bit more shape, with a darning needle, and one piece of yarn at a time, take a small stitch, entering from the back of the head through to the front, next to an eye, on the nose side, and return the needle to the back of the head. Repeat for the other eye. Pull the threads just enough to give the face a friendly expression. Fasten off. The remaining ends of the yarn can then be used to attach the head to the body. Position the centre back of the head on to the marker on the front side of the body. Squash the head a little with your fingers, and sew onto the body, leaving the top half of the head free. Using a pair of double pointed needles, and 2 strands of yarn, cast on 3 sts, and work an I-cord for 8 cm. knit 3, don't turn your work, just push it across to the other end of the needle, and K3 again. Just repeat this for the length required, and cast off. Attach to the back of the cosy in the marked spot, or where it looks right to you. The tail will curl a little by itself. Using two strands of yarn, cast on 6 sts. Knit one row. Second row, increase one stitch at each end; 8 sts. In the middle of each row; decrease one stitch per row until 3 sts remain. Knit 3 rows. Cast off. To place the ears, first measure 3cm vertically up from the top of the eye. Pin each ear in position, 3-4 cm above the eye; adjust slightly to give a pleasing appearance. The ears are sewn on with the cast-off edge pointing to the outside of the face; when sewn; flip over. Cast on 10sts with 2 strands of yarn together, on 6mm needles. Join side seams, run a gathering stitch around the top, pull tight; stuff with the tails of the yarns...the paws are little and this is probably enough stuffing. You can add a bit of polyester fibre fill if you think it needs it. Run another gathering stitch around the open end, pull tight to form a ball. Attach the paws to the front of the cosy at the marked spots. 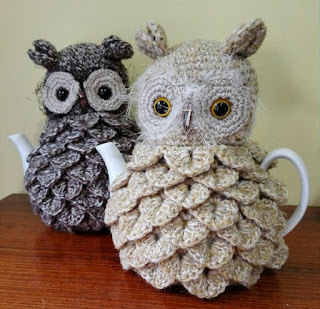 Here's a free pattern for the owl tea cosy. Please support our Cancer Council fundraiser by donating a hand made tea cosy or soft toy to the Tea Cosy Competition. Scroll down to the previous posts on this page, to check out all the information that you need, to help us achieve our goal of raising $50,000 for the Cancer Council. Worked in crocodile stitch and double crochet. You’ll need a 4 mm crochet hook, and 2 x 50g balls of 8 ply yarn, plus a small quantity of a lighter colour yarn for the eye circles. 2 purchased eyes. Bead or toggle button for the beak. With a 4 mm crochet hook and 8 ply yarn, make 29 chain. Row 1. Work 1 treble in the 5th chain from the hook, *miss 2 chain. In the next stitch, work 1 tr, 1 ch, 1 tr. * Repeat from * to * to the end of the row. Note that there are now 9 V-shapes. Row 2. Right Side. Work 3 chain. This counts as the 1st treble. Working down the right- hand side of the first V-shape, work 4 more treble, 1 chain. Note that the treble are worked such that the Wrong Side of the treble stitches forms the Right Side of the work. The stitches sit nicely when worked this way. Note: When working the last treble of the last scale, instead of working it over the shaft of the V-stitch, work it into the 2nd last chain stitch; this will avoid making a hole larger than the others. Row 3. 3 chain; work a V-stitch (1 tr, 1 ch, 1 tr) in each of the 1chain spaces of the first row. Work the hook under the join between the crocodile scales as well as the 1 ch space, as you work every second V-stitch. Finish with 1 tr into the third of the 3 ch that was worked at the beginning of row 2. Row 5. As for row 3, except that the last treble will be worked into the treble of the previous row. Row 6. 1 ch, 5 tr down post of first V-stitch, 1 ch, 5 tr up other side of V-stitch. Miss 1 V stitch. Repeat to the end of the row. Slip stitch into the 3rd of the 3 chain. Repeat the last 2 rows until 7 rows of scales have been completed; ending with a row 6. Row 1. For the next V stitch row, 3 chain, miss the first 1 chain space; V stitch into each of the next 7 1-chain spaces; miss the last 1-chain space; 1 treble into the last stitch of the row. Row 2. Work 4 crocodile scales. Work as for the first side; don’t break off the yarn. Sew the lower edges together, for approx. 2 cm. Working in rounds with right side facing, 4 chain, 1 treble into the same spot as the 1st chain, catch the top corner of the other side of the tea cosy as you work this stitch. Continue around with a ‘row 3’ as before, catching the two top edges of the other side of the tea cosy as you work around. End with a slip stitch into the 3rd of the 4 starting chain. Next round, slip stitch across the next 1 chain space and into the second 1 ch space. Work one round of ‘scales’. End with a slip stitch into the first treble. Round 1. 6 dc into a magic ring. Rounds 8-18. Work 1 dc into every stitch. Rounds 19. 1 dc into the back loop only of each stitch. Round 20. (5 dc, decrease.) 36 stitches. Round 21. (4 dc, decrease.) 30 stitches. Round 22. (3 dc, decrease.) 24 stitches. Round 23. (2 dc, decrease.) 18 stitches. Round 24. (1 dc, decrease.) 12 stitches. Round 25. Work 1 dc in each stitch…..12 sts. Finish off, leaving a 15 cm tail of yarn. Using a 4mm hook and a lighter colour, work 4 chain, join with a slip stitch to form a ring. Round 2. 2 dc into each dc of the previous row…….. 16 stitches. Finish off; leave a 30 cm tail of yarn. Pin the eye circles in place; the lower edge of the circle should be just touching the 16th row. The circles should nearly meet at the centre front. Attach the purchased eyes through the centre of the circles and through the head. Stuff the head softly, so that the base (area below the 19th row) sits flat. Using the tail of yarn at the lower end of the head, stitch a row of running stitches around the opening. Pull the gathering thread tightly and fasten off the opening. Slip stitch the eye circles onto the head, using the yarn tail. Finish off. If desired, stitch a fluffy yarn around the outer edge of the eye circles to give a feathery look. Sew on a bead or toggle button for the beak. Thread a large darning needle with yarn in the same colour as the eye circles .Insert the needle through the middle of the base of the head; let it come out close to the inner side of one eye. Take a tiny stitch, and pull the needle through close to the insertion spot. Pull the ends to make the eye go deeper into the head. Anchor the stitch securely. Repeat for the other eye. Please note…these are not ears. Work 11 chain. Treble into the 5 chain from the hook. *Miss 2 chain, work 1 treble, 1 chain, 1 treble into the next stitch. * Repeat from * to*. 3 chain, turn. Work 2 crocodile stitch scales as before. Fasten off. Fold horizontally. Attach the head feathers, using the photo as a guide. Join the head to the crocodile stitch body. The centre front of the head is in line with the centre front of work. The openings for the handle and spout of the teapot line up with the sides of the head. Slip stitch the top of the body to the loops along row 19 of the head. Please support us in our quest to 'Craft a Cure for Cancer'. When you donate a tea cosy, soft toy, or other small handmade item, 100% of the sale price goes to the Cancer Council. We divide the donations into themed groupings; you're free to make any pattern that you wish; but when we display the craft work, we'll group things into themes as much as possible. 'International'....something that is iconic in its home country; for example, for the U.K., it could be Big Ben, or the Queen's corgis. For the U.S.A., it could be Donald Trump. 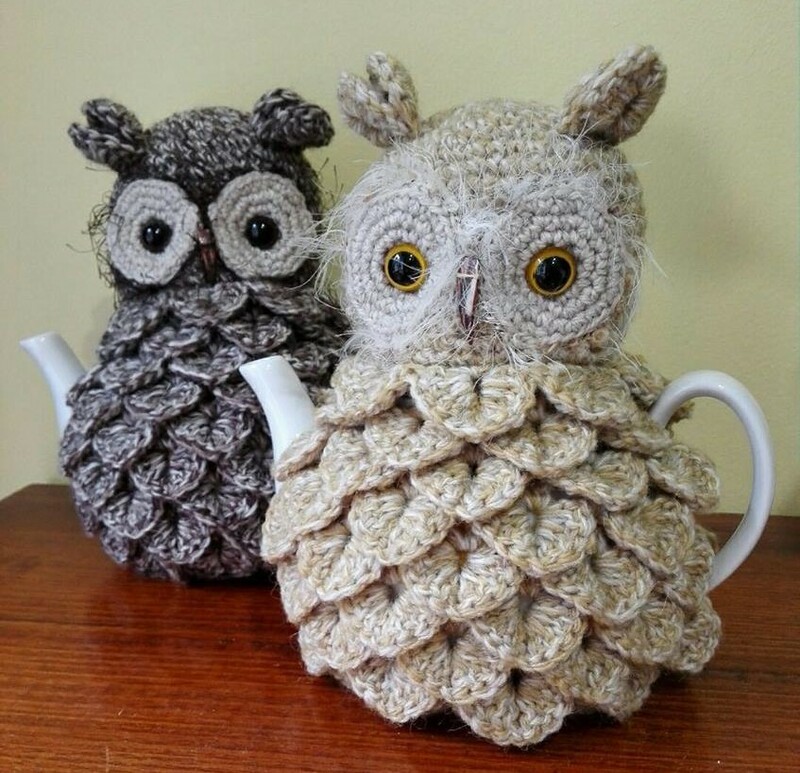 'Grandma's Kitchen' ..tea cosies or toys that are knitted or crocheted foods. 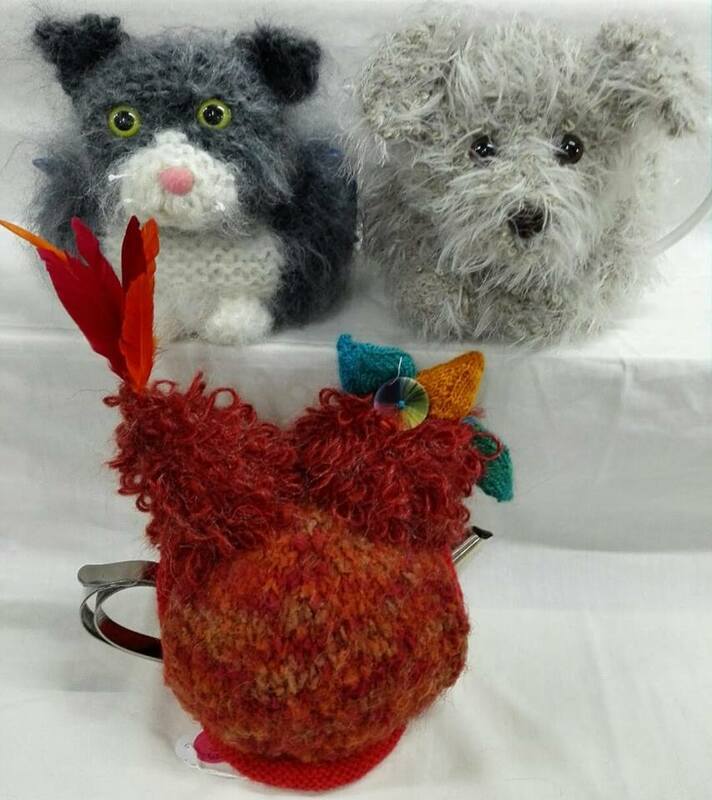 'Pets'...handcrafted toys or tea cosies featuring pets, such as cats, dogs, birds, horses, or other pets..
'Flowers'...always a popular theme in our display. Tea cosies decorated with flowers; or knitted or crocheted flowers, in knitted or crocheted pots. 'Australiana'...iconic Australian items...always popular with the tourists that come through the exhibition...kookaburras, koalas, kangaroos, Sydney Harbour Bridge...etc. Beanies and toys are usually more attractive to tourists; not many are into tea cosies. 'Vintage'...made from the really old patterns. 'Behind Closed Doors'...Every year, there are some tea cosies that elicit a lot of mirth. Quite accidentally, they turn out to be a little risqué. If you make something that is innocently a little 'R' rated, we'll put it in this category. Please scroll down for more details about how to enter the 2018 Tea Cosy Competition.